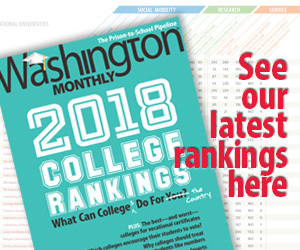 Washington Monthly | It’s Stupid! OMG. Did D.R. or David suddenly decide to launch a Struggle for the Soul of the Democratic Party this weekend with an anti-HRC bender? It’s not like I monitor the site closely when I’m off cleansing my mind from politics for two days. The Republican National Committee released a new web video, “It’s Nuts,” starring the HRC Squirrel, who has been tailing Hillary Clinton and the Ready for Hillary bus as they travel to recent stops on her “book tour.” The squirrel made its first public appearance Friday at Hillary Clinton’s event at The George Washington University’s Lisner Auditorium. The HRC Squirrel is a political animal, or sciurus politicus, determined to let Americans know that another Clinton in the White House would be nuts. Known for its keen memory, the squirrel recognizes the dangers of a Hillary Clinton presidency and will continue to dig up her record, no matter how hard the liberal media tries to bury it. Here’s the video, complete with a Reince Priebus cameo. It must reflect some sort of humor that is highly elusive to me. I would worry about more “political animals” from the RNC fouling the ozone. But I don’t think this series has furry legs, or the sense God gave a goose.